Carol, I think it's great! Love the paper pieced pumpkins and the flourishes! Great take on the photo. I knew you would come through on this one and the scored tiles are a great idea. Love the paper pieced pumpkins, too. Well done on a real challenge which I think makes it more fun when a person finally conquers it. Love how you did the tiles, and the paper pieced pumpkins look great. Neat card. I am so proud of you! You were determined and ended with great success! I love all of the elements you pulled into it. That is a tough one! You've done a beautiful rendition; your pp pumpkins and stem flourishes are adorable! Love the tiled background and paper pieced pumpkins. Thanks for joining Speedy Fox and Friends. Wow, Carol, you really nailed that picture on the head! Gorgeous paper pieced pumpkins and the swirly vines against the tiles are perfect! Total honesty, the photo was a bit of a challenge for me too. You did a TERRIFIC job with the challenge! !1 Your tiles look great and I love the paper pieced pumpkins!!!! Thanks for joining Speedy Fox and Friends this week! 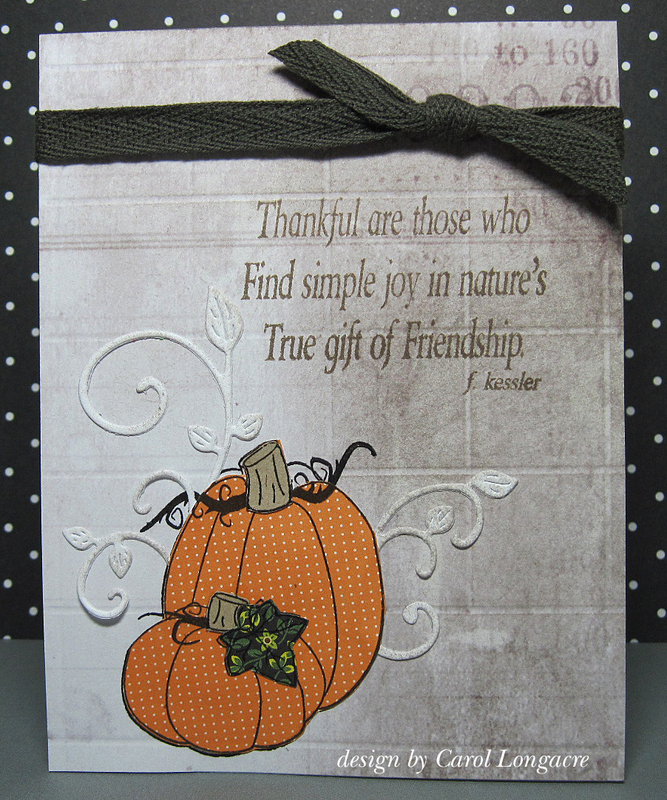 I love the paper pieced pumpkins and the tile back ground. You die a wonderful job on the challenge. Thanks, so much for joiniong us at Speedy Fox and Friends. Great job with the challenge, Carol! Nice Autumn card! Very pretty Carol. Great take on the photo inspiration. The paper-pieced pumpkins are really nice... great background!